It’s in the countryside where there’s beautiful green fields, trees, and peace and quiet. My mom cooks the most amazing food. They have a wood stove! With the rain, changing colors, and cooler weather comes warm, cozy fires :) Since Sid and I are driving back to Santa Barbara in just a couple of weeks, I feel like I have to take full advantage of fall while I’m here in Washington. 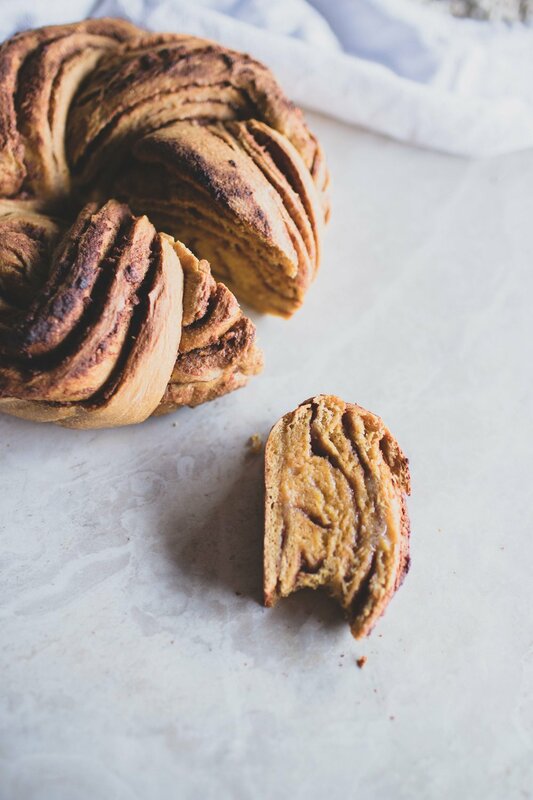 I know we’ve barely finished summer, but I’m already dreaming of pumpkin baked goods and everything that comes with fall! It’s like I have two weeks to soak up fall before I move back to summer in Santa Barbara. 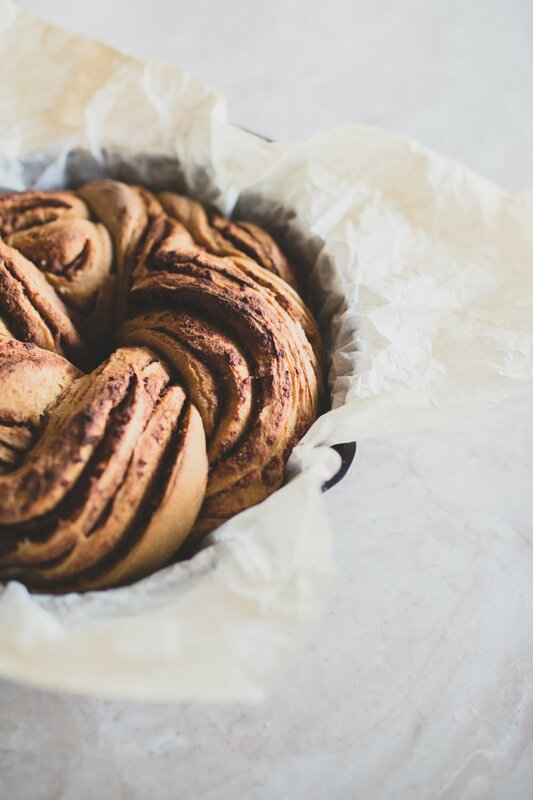 Recently, I came across a photo of a Chocolate Cinnamon Sourdough Twist bread on mydailysourdoughbread.com, and I thought it looked pretty amazing. Unfortunately, I’m trying to stay away from all added sugar for a month. 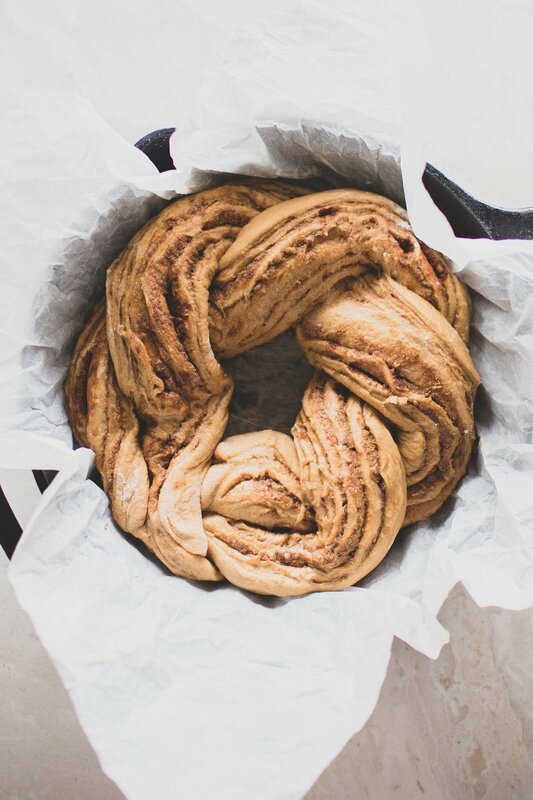 There goes the chocolate cinnamon twist bread… BUT… I can have dates! And you know what’s almost as good as chocolate? Pumpkin. The night before you make the bread, prepare the levain. Add the starter, water, and flour to a bowl, mix together, cover with plastic wrap, and let it sit overnight. 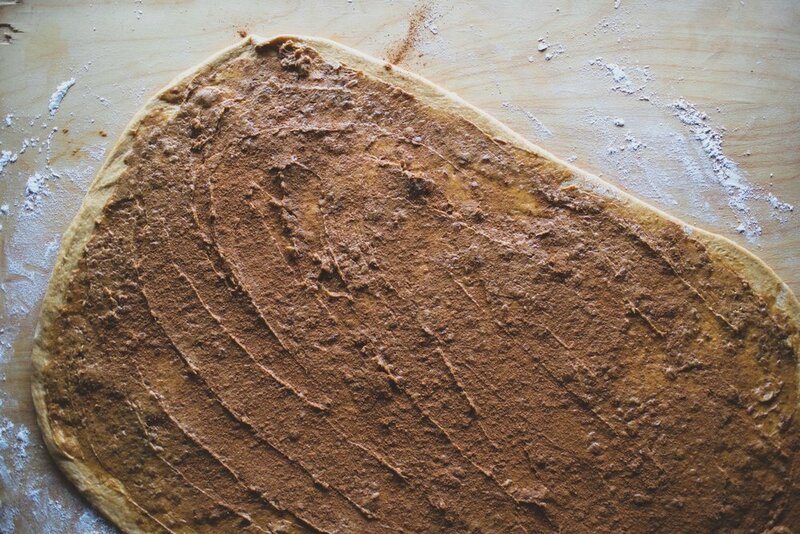 In the morning, combine your levain, the warm milk, melted butter, pumpkin puree and egg yolk. Stir with a spoon until well combined. Add the flour and salt, and mix together with your hands until there’s no more dry bits of flour. The dough will be sticky, but do your best to need the dough for 5 minutes. After you’ve kneaded the dough, let it sit for 30 minutes. After 30 minutes, stretch and fold the dough. 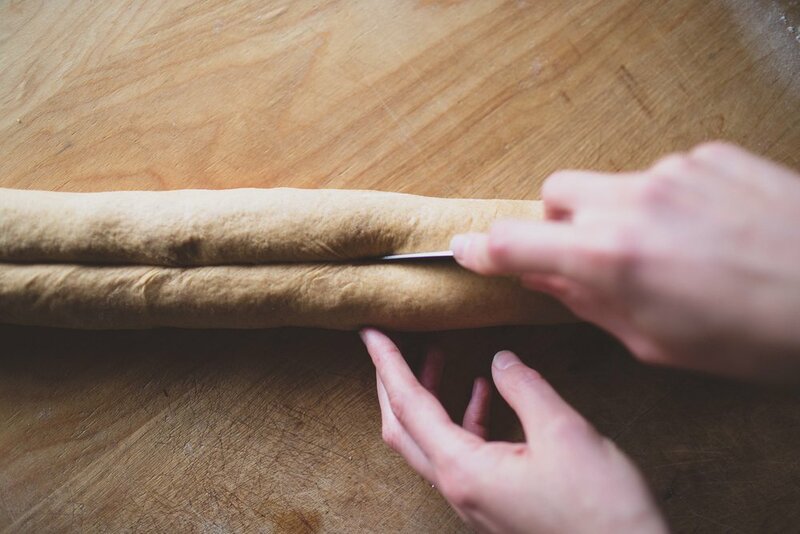 To stretch and fold the dough, pick up one side of the dough with wet hands and fold over the rest of the dough. Repeat on all four sides of the dough. You will perform three more sets of this spaced 30 minutes apart for a total of four sets of stretches and folds. After four sets of stretches and folds, let the dough sit for one more hour. While the dough is rising, prepare the filling. 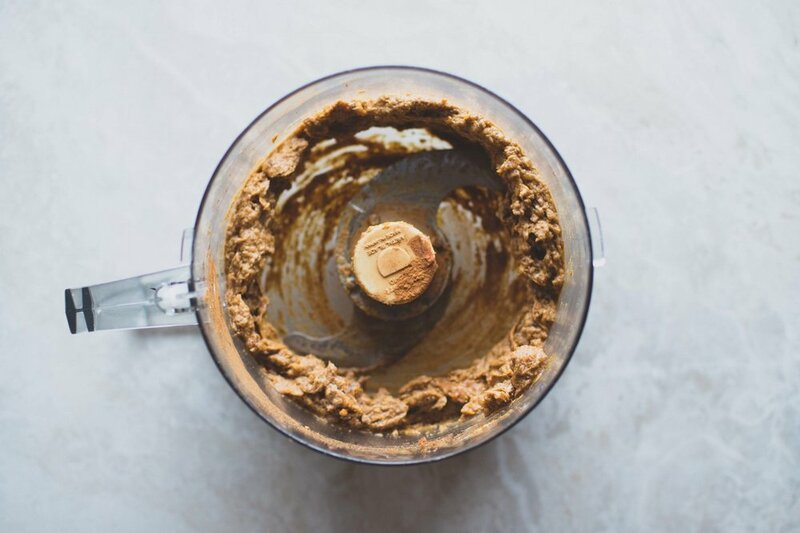 In a food processor, combine the dates, butter, pumpkin puree, and cinnamon. Food process until smooth. 7. Once the dough has finished rising, flour a clean surface and roll out the dough into a large rectangle about 5-10 mm thick. 8. Spoon the filling onto the rectangle of dough, and spread out evenly over the surface all the way to the edges. Picking up the edges on the long side of the rectangle, carefully roll the dough up into a long log. 9. Slick the log all the way down the middle. Open up the two pieces of dough so that the two halves face outward. Carefully twist the two halves over each other to form a braid. 10. Prepare a circular baking pan or a cast iron skillet with a piece of parchment paper smeared with 1-2 tsp. butter. Place the braid in the cast iron so that it forms a circle, and pinch the two ends together. Let rise until almost doubled in size, or about 1.5 hours. 11. Preheat the oven to 375º F. Place the bread in the oven for 40-45 minutes. Let it cool before slicing into it!